During August, a fence and gates will be installed at the Rolleston dog park. The ‘temporary’ fence is a permanent structure, however it will separate the Selwyn Dog Training Club area from the general public area during club training sessions and events. For the majority of the time, the entire dog park will be open to the general public. The total area of the proposed fenced area will be less than half the dog park. The Selwyn Dog Club has a lease to operate on the park and has developed a clubroom facility at its own cost – much in the same way as sports clubs operate on other reserves. As a condition of this lease, the club can operate on part of the park for its training purpose and the fence formalises that area. The club also has the right to close the whole park (12 days a year) for competitions and large events. These days are advertised ahead of time and allow the club to participate in regional and local competitions. The club does not close the park for more days than its lease provides for. 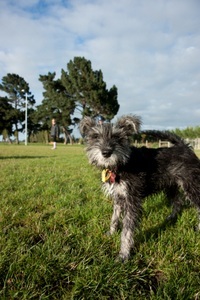 The Council has ensured that dogs and their owners can enjoy open spaces throughout the district. All parks and reserves, except Springston South Reserve, are dog exercise areas. Dogs can be exercised either on a leash or off leash in these areas, but dogs must be under control. Under control means that the dog obeys commands and doesn’t bother or cause a nuisance to other people or dogs. The Foster Dog Park in Rolleston township allows dog owners to exercise their dogs off-leash in a safe and secure environment. 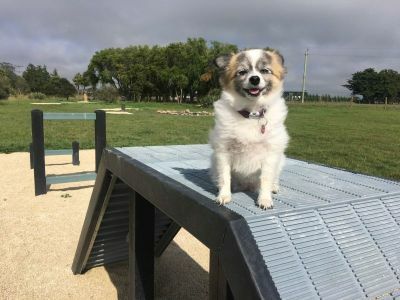 The park is 2 hectares, fully fenced with double-gates, and contains carparking, dog wash facilities, seating and picnic facilities, three dog agility equipment areas, water play, and a secure area for small, young, or nervous dogs. Location - corner of Springston Rolleston Road and Goulds Road, Rolleston. Dogs must be on a lead when entering and exiting the dog park and wear a collar with a current Local Authority registration tag at all times. Owners must carry a lead at all times. Dogs and children must be accompanied and supervised by an adult at all times. Be a responsible parent and do not bring your small children into the dog park. Equipment in the dog park is for dogs only. Please do not let your children climb on the equipment or use the grounds as a play area. Dogs and puppies must be fully vaccinated. Owners are required to pick up and dispose of their dog’s poo. No bicycles, skateboards or motorised vehicles allowed. Dogs that show signs of aggression must either be muzzled or removed from the park. Dogs that are sick or in-season are prohibited. Owners use the park at their own risk. Please note: the dog park is booked by the Selwyn Dog Training Club for training on Tuesdays, Wednesdays and Thursdays from 6.30-9pm, on Sundays from 10am-12pm and on the occasional weekend for competitions. Please keep your dog on a lead and well away from the training area during these times. Selwyn Dog Training Club upcoming events, which may restrict public access to Foster Dog Park, can be found on the Dog Training Club website. Leeston now has its very own Dog Park. 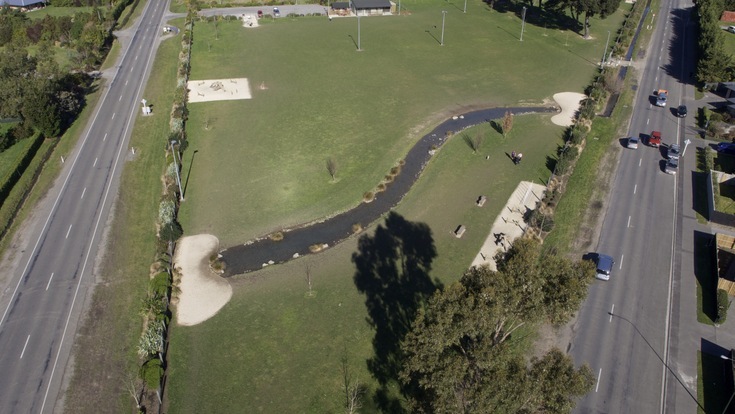 The 1.8 hectare dog park is located in the area of Council land between the entrance to the A&P Showgrounds and the Ellesmere Heritage Park. The Dog Park opened in late 2017. It is fully fenced and features dog exercise equipment such as hurdles, jumps, balance beams, pole weave, ramps, a tunnel and more. It also features a small pond and a grooming table. A carpark and entry is located next to the A&P Showgrounds entry, off Leeston Road. 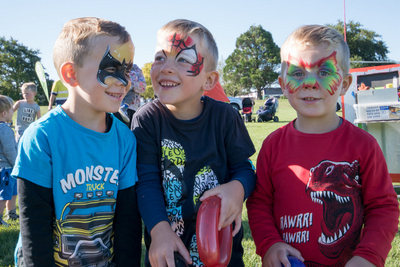 The project to establish the new park was promoted by the Leeston Community Committee.